This entry was posted in Comments about Cycling on February 2, 2017 by Steve Tilford. I’m not big on structured training. I’ve never really used it, so can’t really knock it, but know I wouldn’t enjoy it. Does that make sense? I think if I’m going to go that hard, I might as be in a race. And that is my normal practice. Get fit enough to race and then race to get fitter enough to race well. I’ve done this pretty much my whole bike racing life. I like riding with guys and training hard. I guess that is structured somewhat. I normally train pretty hard, at least compared to other groups I go ride with through the country. I don’t know if that is a good thing or not because, again, I’ve never done it any other way. I say all this, but the invention of the Garmin kind of mixes up the equation some. I like having a Garmin and I like the data saved. I’ve never really kept a training diary and Strava is now that diary. Way more information that I would have put down in writing, for sure. Mileage, time, speed, heart rate, power numbers, etc. It seems kind of silly when you think about it. My “new” Garmin isn’t doing that well. I have a Garmin 1000 and it has always been temperamental. I had a Garmin 800 before that, but the day the Garmin 1000 showed up, Tucker decided it was time to make the old Garmin his toy and chewed it up. Bad puppy. Anyway, I want to send this Garmin back to Garmin to get fixed, but think they have already done that once. Plus, I don’t really want to be without it while it is being repaired. My Garmin is getting super hard to charge. Plus, after it is charged, it doesn’t stay that way very long. That is just the start of the list. Sometimes it locks up. Right now it won’t download data easily. It won’t sync to my iPhone, so I have to plug it in to try to get the data downloaded. I have been thinking about getting a newer Garmin. Then I read this review on the new Garmin 820. These guys don’t seem to be much happier with the new 820 than I am of the 1000. The review said only 5 hours of battery life. That won’t do it for me. So I’m in a predicament. Eventually my Garmin will just quit working. I thought that was right after Christmas, but i came back to life. Maybe I can nurse it along for another month and when Trudi heads to Europe to work, in March, I can just use her’s and send mine in. Until then, I guess I’ll just put up with it. I don’t like it much. This seems to be the only position where I can get it to recharge. I have a Garmin that I purchased a number of years ago. Maybe I should restate that to say I bought the Garmin years ago and it has been “replaced” three times. Each time it was internal problems and each time it costs me more to fix or replace than I think it should. The most recent sounds kind of like yours in that the battery took a long time to charge and discharged very quickly. Adding that to the time it took to download and I found it a major headache. 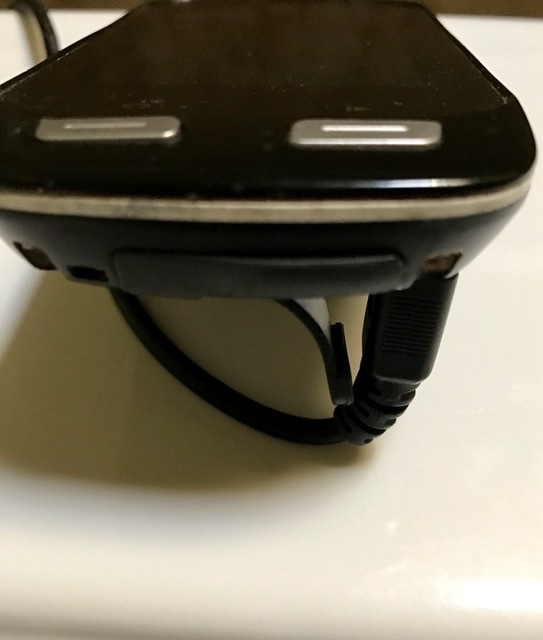 I got a replacement, from Garmin, for $80, but this was the third one. I would be hard pressed to recommend a Garmin, for a bike, to anyone. When it dies the next time, it is time to move on. On a similar note, why is it that we can buy a Garmin for our cars, with a LOT more bells and whistles in a nicer package, for MUCH less than what we pay for a bike model. I got a really nice auto unit for about $275 and it is a lot better than anything I can get for the bike. Maybe they just think we are so stupid as to pay what they are charging? My club rides are different starting points and routes every day (riding, not training) and everyone uses a Garmin to download the course. But every ride someone’s freezes, a tcx file is corrupted, someone goes right instead of left…. and in the end everyone’s elevation is different. Like any electronic device we have become so dependent on the things it is frustrating when they crap out. My old wired Cat Eye computer didn’t have HR, Cadence or Navigation/Elevation but I miss it. At least I have always had good experiences on the phone with Garmin when my 500 has had issues. The Wahoo was reviewed alot last year but still have not seen anyone using it, looks like Garmin owns the market. I’ve been generally happy with a 500 and now a 520, which I think is great. The 500 went through the wash and I brought it back to life by spraying contact cleaner into the charging port. Worked for another two years after that. I suspect it voids the warranty, but you might have little to lose. For <$10 head to Amazon or the car parts store to see if they have a can of electronics contact cleaner. Does Radio Shack still exist? Hose it down with that stuff and see if life improves. Unlikely to make things worse. I sometimes bring a power bank with me on rides. I bought a cheap one for a few dollars to use with my phone. I then realized with another cable I could also charge my NiteRider headlight and also my Garmin. I can use both of these while charging them. I use a little bag on my bars on some of these longer riders and just put the battery pack in there with a short cable but you could easily tape it to the stem. Anyway, not ideal, but something to consider on an all day ride. I’m holding out for the Garmin 1000000. I have the Garmin 520 and it works well. No problems for me, and more than 5 hours of battery life (though when have I cycled over 5 hours straight recently?). It also works well with my Garmin VivoSmart HR, which I use for heat rate. Economics. There are way more drivers than cyclists. I really don’t understand the fascination with numbers and gadgets. If you are a pro or have a pro -like situation (no job) then by all means use the numbers to optimize your training. If you have a job and/or kids, your limiting factor is basically saddle time. There are no junk miles. Do some intervals on your way to work when you feel up for it. Spending time analyzing your numbers or paying a coach to do it for is using time or domestic capital that would be better spent on saddle time. Not to mention a killjoy. If you are going on an adventure ride, you better have a paper map on you anyway. Electronics always find a way to not work. Garmin has a service center in Olathe you can take it to so that you can get taken care of same day. I had a bunch of problems with a Garmin 820 when I last upgraded. Decided to go with the Wahoo ELEMNT after that. Much prefer it – no touchscreen, which I like. When you’re busy with kids, family, and work and have very little training time you need to get the most out of it. Structured training will help you get the most you can out of your limited time. I can go over numbers before putting the kids to bed, but I can’t be on my bike those 10 minutes. Sure, any time in the saddle helps, but your limited time can be spent more effectively with a training plan and knowing what you’re looking at/doing. A pro who can log many more hours doesn’t have to be as exact with their training. Lots of base miles and race to get in race shape….like Steve is used to, works well for many. Some structure will help them get that last 0.5% they need or want, but the family dad can get much faster with fewer hours by following a plan than just winging it. I have a Garmin 1000 and love it. No problems and I love the firmware updates. More features than when I bought it. I’ll second the Wahoo ELEMNT; I’ve been using for about 6 months and it’s been absolutely perfect. Push buttons works well with gloves, grayscale display looks awesome in direct sunlight, update and modify screens in real-time from your iphone. You should definitely give one a look. I also have the Garmin 820 and love it. I can get at least 12 hours of run time in summer. Winter shortens it some. I had some issues early on and contacted Garmin. We decided to do a complete reboot which worked really well. They are after all just a miniature computer. Garmin’s main business is avionics. Given my experience with their bike computers, I was horrified when I learned this. However, upon further reflection, I think they use their bike computers as an apprenticeship for new employees and as a pasture for experienced ones who aren’t good enough for the high-end stuff. That explains the inconsistencies in interfaces between the various units and sketchy function. The competition entering the bike computer market is a good thing. I don’t know if Garmin will try to step up their game, but I think they have the talent to do so if they choose. If you are using the Bluetooth to sync with your phone for live updates to Strava or have the WIFI tuned on, rather than off, your Garmin is using two of its biggest battery drainers. No computer, no numbers, no data, no metrics… just ride. Its more fun that way. Agreed. Modern technology has made the simple enjoyment of cycling more like a chore. Simplicity rules. Like others I’ve been through a bunch of Garmins (Garmnen?). I had 3 or 4 800s that kept dying because I sweat a lot and it was corroding them. I’ve had good luck with the 520, only having to replace it once. Garmin will warranty them often or give you a refurb deal if not, and they will go ahead and ship your new device before receiving your old one; they charge your credit card for the new one but then refund as soon as they get the old one. I’d rather not have to replace it at all but I can’t argue with their customer service. I do some training but I mainly use the Garmin just to create a record of my rides. Nothing fancy, just nice to look back and say, hey, I rode 45 miles on June 18th with a bunch of fast dudes last year, that’s pretty cool. Wahoo is heading in the Garmin (and everyone else domestic who manufactures in Asia) route made famous by sRMA. Let the customer pay top dollar for products that break with great regularity. Solution: immense focus on the marketing budget and dealer penetration so nobody can shout loud enough to get traction with the solid common sense article of fact customers are being extorted to do their research and QC. The only head units on the market that are of any interest are the Pioneer and SRM. The latter being the torchbearer for medical level precision that needs to be sent off to recalibrated every so often. I have no doubt that structured training produces results – but over a cycling life of 35+ years & nearly 400k miles I’ve never been interested or able to have that kind of structure. Again, I’m not knocking it – just always felt it would diminish the sheer joy of riding. And my Garmin 520 is ok but by no means flawless. I wish I could do without it! They are TOTALLY different units, I’m not sure how you can compare. Just because the bike units are small in size, doesn’t mean they are less “nice”. They can actually be much more of an engineering challenge than people on this thread are giving credit for. As for the software… I think it could use some work. I had a Garmin 800 which randomly died and a 520 which crapped out 1st day of a 4-day Brevard, NC trip. Aftet that I bought an ELEMNT and couldn’t be happier. They tend to Blackout in Kansas, it will be fine once you cross the state line! Just dig up an Old Avocet or get Lemond to send one to you I bet he still has a few in a junk box somewhere! Only kidding but seriously what did Merckx do?! He rode lots of grades in the dark. Got a brain. No need for Garmin. Check out the Edge 25, the “minimalist” garmin. I love mine, it connects with my phone via bluetooth, and only gives the data I need. It can pair with power, and if you link with a speed sensor it fixes it’s minor distance accuracy tracking. I’ll never go back to a big head unit. My 5 years of frustration with Garmin are over. 5 minutes of “firmware updating” while sitting at the start line was enough for me. I have to laugh every time I look at Strava feeds containing “garmin fail!” yet they stay the course. I switched to Lezyne Power GPS, problem solved. Doesn’t have all the BS bells and whistles that garmin tries and so miserably fails at. Had the 500 and the 800. Both had issues. Got the 520 – all really good the last two years. Agreed. But I think It depends on your goals. And personal preferences. I like playing with new bike widgets to increase my motivation at times. Stay on the bike…whatever tools or toys it requires! I’ve used the strava app on my smartphone for a year and a half. Training, races, hot days, cold days, in the rain, crashed… Every ride recorded and saved accurately, even in remote locations. Really have love hate relationship with Garmin. Have an old Edge 710 that ran pretty well for many years. As performance became erratic, I bought at Edge 810. I have returned this unit 5 times in first 6 months. Current ‘refurbished’ unit is working, but of course not using it as much during the winter. I bought the Edge 1000 when it came out and I haven’t had any problems with it. As with any product YMMV. I like the Garmin Edge 500 – admittedly old school – for bung-for-buck. I’m on my second one in 5 years but at $200….it captures all the data i want and more. Phone? Blue what now? I plug it into pc or laptop and save the .FIT file and then upload to Training Peaks, Strava, whatever. Strava is a bit pointless for segments – without accounting for wind conditions, group etc. but they continue to evolve in other areas. Their fitness / fatigue lines / chart seem to line up with training peaks. Battery life never an issue. Can load maps onto it or use it to create maps. Turn-by-turn = yes. No fancy ginormous color display but there’s your battery consumption right there. Black & white yes but it is back lit. Early adopters of some tech, LATE adopters of other. Check out DC Rain Makers review – whoever that guy is. Who IS DC rainmaker??? The world may never know. I’d have to disagree with you on this. I’m a father of two 13 year olds with all the bus driver duty that that entails and having a device to record my rides is imperative to make the little time I have on the saddle as productive as possible. Of course being an engineer and an avowed data and gadget freak doesn’t hurt. One thing though, my use of a garmin by no means decreases my love of riding and my enjoyment of being on a bike and going as fast as I can. Well, people DO keep buying them, in spite of how bad they are. I have a Garmin 500, and it is a pretty good unit. I’ve had it a long time, and the plastic bracket on the back of the case didn’t break off. LOL I decided not to upgrade because with each new successive generation, they got worse. It’s important to read the reviews before upgrading to the next gen of any product. What people do is keep buying “the latest and newest” and that is also true of bikes. Just keep paying more and more for lower and lower quality equipment and there are many reasons for this I won’t go into. That’s ok if you have money to burn, but who has that in this day and age? And not talking about Steve, since he rides titanium, the best bike frame material out there, but about the general cycling consumer public. So what are people going to do without Garmin? What’s next? Garmin makes a wide range of products for many applications. I’d suggest going with a bike specific company. Like Cateye. They’re a japanese company that manufactures in both Japan and China. Ok, so it’s not trendy or groovy, but if it’s reliable, why not? Garmin headquarters are in Olathe, KS you should be able to just drI’ve over and swap it for a new one. As an old-fart I’m just happy to get confirmation that it’s NOT me that’s the problem! After too many failures and customer service nightmares, I bailed on my Garmin Edge and tried a Wahoo Elemnt. It had some minor issues with sensor connections when it first came out, but for the last year or so it’s been rock solid. It doesn’t have as many features as the Edge units do. I particularly wish they would improve Live Tracking functionality (supposedly on the development path). But it does what it does really well. I use it to replay rides on my smart trainer, and for recording rides outside. The screen is easier to see, the buttons are easier to navigate, and it just works. I’ve never lost a ride, or had a GPS failure, or strange data recordings.